LMS vs. LCMS: What is the difference and why does it matter? LMS vs. LCMS? While sometimes thought to be interchangeable terms, LMS (Learning Management System) and LCMS (Learning Content Management System) platforms share a few functionalities, but couldn’t be more different. In this article, we deep-dive into the definitions of each, key differences in capability, and provide a platform comparison. A Learning Management System (LMS) is a software application that allows a company, school, or organization to administer, document, track, and report on the delivery of educational courses and training programs. An LMS will deliver learning, tracking course access, completions and test scores. It is not used to create content. A Learning Content Management System (LCMS) is a tool for actually creating learning content and publishing that content in a variety of formats. Some LCMS platforms also allow you to deliver learning and track performance, with limitations. A Content Management System (CMS) is a program or set of programs used to create, publish, and collect content assets like videos, articles, slideshows, images, and more. It is not specific to learning and development and is used across hundreds of industries. LMS vs. LCMS: What’s the difference? While there are many differences, generally, an LMS is used more for training delivery and administering courses, while an LCMS is usually a platform that allows learning content to be created and delivered. How does a CMS differ from an LCMS and LMS? 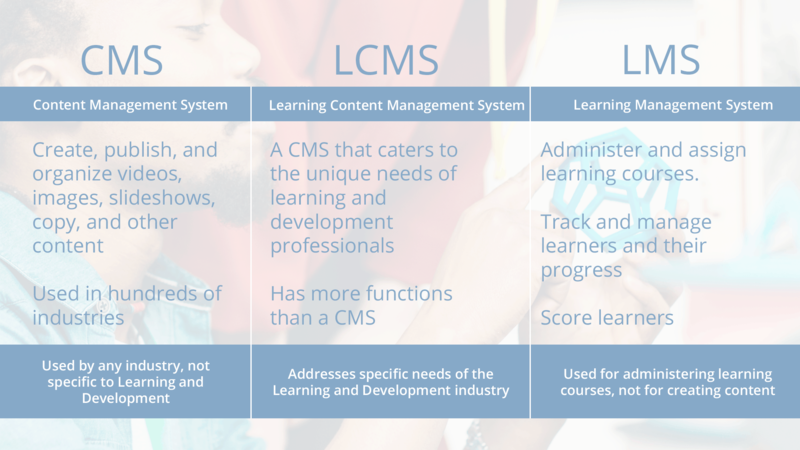 An LCMS is a content management system that takes it a step further by offering functionalities and capabilities that address the unique needs of the learning and development industry (like content reuse, multiple languages, competency and certification support). An LMS is less focused on content creation and management and more focused on delivering and administering learning courses. What can an LMS do that an LCMS cannot? Learning paths by competency, job role, certification, etc. What can an LCMS do that an LMS cannot? A modern LCMS will manage content for every aspect of the learning process, from rapid authoring to delivery. Learning teams can use an LCMS to develop content using design templates, reusing content elements across courses and learning departments, importing and integrating content from other authoring tools, and publishing the content to multiple outputs and devices. Below we outline some of the key differences in functionality between an LMS and an LCMS. Why should an organization use an LCMS? While an LMS allow instructional designers, training managers, and CLOs to lead courses, little to no information on the content’s effectiveness is provided, and all assets must be created in third-party platforms like Microsoft Office, Storyline, and Camtasia. A good LCMS will allow you to create content within its system, and import third-party created assets. Many have templates that speed up the course creation process, link content elements to make updates more efficient, and can provide detailed insights on the performance of individual courses and content elements. Some LCMS platforms also allow content to be created once and published to a variety of formats (i.e. HTML, PDF). Plus, an LCMS will usually integrate with an LMS. How does Xyleme fit into the LMS and LCMS comparison? In the past, LCMS platforms were focused strictly on authoring and publishing. Xyleme has implemented a delivery and tracking solution that takes the traditional LCMS a step further. For more information on what sets Xyleme apart from the rest, read Why Xyleme?